Cambridge Audio Minx Go review | What Hi-Fi? Cambridge Audio is on a roll with its new range of wireless speakers – we have already awarded five stars to both the bigger Minxes, the Air 100 and Air 200. And now it’s the turn of the baby of the range, the Cambridge Audio Minx Go. 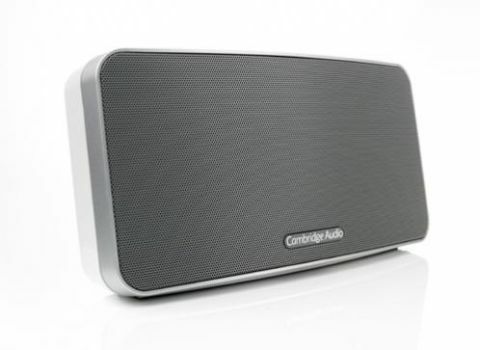 The Cambridge Audio Minx Go is a £100 wireless speaker that will play music streamed to it via Bluetooth or direct through a 3.5mm input. That’s it as far as connections for playing music go – but for most people in most situations where you would want such a speaker, that should suffice. After all, that Bluetooth connection means that pretty much any smartphone, tablet or laptop can be the source for your tunes. The Minx Go, available in black or white, has a trick or two up its sleeve that set it apart from a regular £100 Bluetooth speaker. Its rechargeable lithium-ion battery is a very different beast from those slow-charging powerpacks of only a few years ago. It takes a mere two hours (give or take a few minutes) to juice it up to its full extent. And then it will provide, it is claimed, a mighty 18 hours of music at what Cambridge Audio calls ‘background’ levels. We didn’t sit there for quite that long in one sitting, but the claim doesn’t seem outlandish to us. We listened for a good few hours over a few days during testing – at considerably more than background levels – and it didn’t break sweat. Another useful feature is that, if the Go is plugged in to the mains, it can charge a smartphone or tablet over the USB socket on the rear. Handy. And this is a well-built piece of kit, too. It’s nicely solid to hold, the heft to it in part explained by the acoustically damped construction it shares with its larger siblings. It’s not so heavy as to make you think twice about moving it around, though – it won’t fit in your pocket, but it will slip easily enough into a handbag or the like. The Minx Go has a little foot at its base that swivels out when the speaker is in use to keep the unit stable. Set-up itself is straightforward. Push the power button on the top of the unit to turn it on, double-press it to activate the Bluetooth connection, and then search for the Minx Go using your portable device. We found it at the first time of asking without difficulty. And then it will happily play whatever it is that’s playing on your source. The unit will remember up to eight devices, so a number of people can use the speaker without any unnecessary IT faffage. You might be grateful that it remembers eight devices, too: people will be queuing up to use the Minx Go. It produces, via Bluetooth, an extremely impressive sound for a speaker of this size and price. It has a rich and warm tone that is really easy to listen to, and doesn’t suffer from any of the somewhat tinny sound that many small speakers inflict on the listener. The bass is impressive for a unit of this size – the bass radiator at the back of the unit is clearly doing its job well. It marries nicely with the two 19mm titanium tweeters and two 5cm midrange units, to produce a well-balanced sound across the frequency range. It copes confidently with Led Zeppelin’s Black Dog, rocking along merrily and keeping the listener’s interest with ease. It handles more subtle stuff well too: Saint Etienne’s Casino Classic mix of Only Love… has lots of bass to go with the clean vocal and fast beat – and the Minx Go provides a sound that seems simply too large for this diminutive box. The sound is on the smooth side of neutral, and the treble has been just a little rounded off – but we believe that is a good thing in a speaker of this type, allowing as it does for a richer, less aggressive sound that is lovely to listen to for extended periods. Vocals come across clear and crisp without being too forward in the mix, and the high frequencies still sing true, despite that engineered roll-off at the very top end. And the effective bass rounds off the overall sonic package beautifully. Playing Ben Kweller’s Homeward Bound, the Minx Go captures the melancholic piano and vocals with unexpected tenderness and accuracy. Background music? This is a speaker you’ll be happy to sit and listen to. Listen over the 3.5mm connection rather than Bluetooth and there are the usual slight improvements to timing and cohesion, but it’s not a massive difference – not enough for us to recommend using it as a preference. This speaker, after all, is all about the convenience of wireless; that’s how we’ll be using it at any rate. What’s more, the Minx Go will go really quite loud without any distortion in the music – an impressive feat, when lesser speakers can quickly get unbearably brash in the upper ranges. Cambridge Audio has completed the hat-trick of five-star Minx verdicts with ease. The Minx Go is a terrific product for this money, with a sound that is a pleasure to listen to for extended periods. It’s an ideal travelling companion – easy to fit in a bag, quick to charge, simple to operate. But we’ll bet owners will use it for far more than that. As a means of filling a small or medium-sized room with your music at a quality that belies its size and price, this one’s a winner.